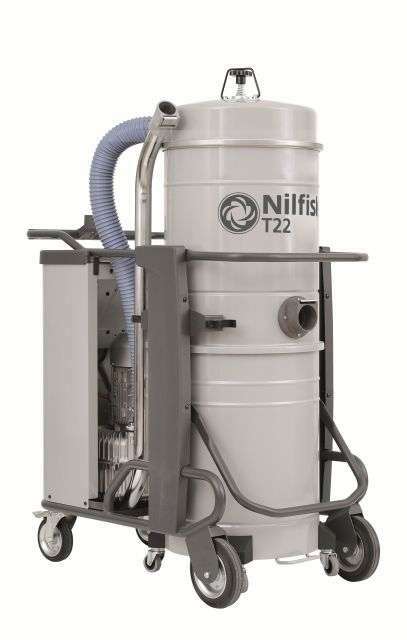 Model T22 is a threephase industrial vacuum for wet and dry material ideal for metal companies. T22 is equipped with a L class filter, also available with M class filter or HEPA absolute filter. Equipped with a manual filter shaker. Silent 2,2kW turbine mounted on the chassis. Gravity unload system with paper bag or Longopac (“endless” bag). Vacuometer indicates when the filter needs cleaning to maintain top filtering efficiency. Container with castors, handle, accessory box, cable-holder and support for pipes. Also available as a Hazardous Explosive Industrial Vacuum Version.